In the Summer of 2013 I was living and interning in New York City. One afternoon, while walking through Washington Square Park, I was approached my a man who started up a conversation with me, and proceeded to repeatedly slap himself in the face. 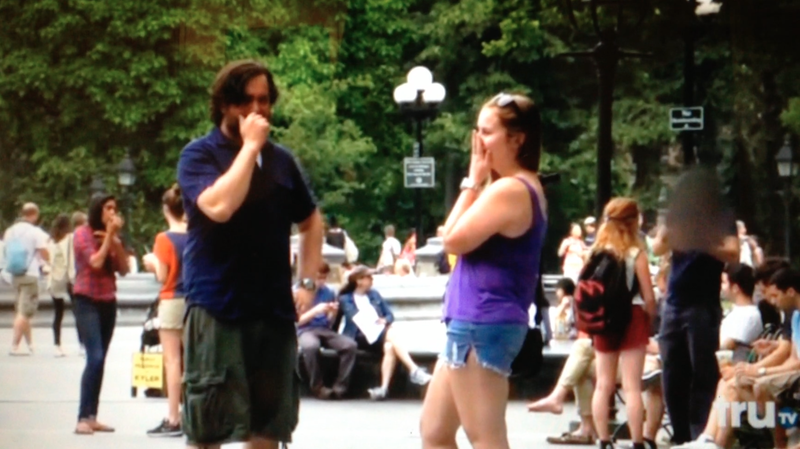 Long story short, I was on Impractical Jokers (a TV show where four guys prank innocent, unsuspecting bystanders). At the end of the Summer I moved back to Miami and forget about the whole experience. I never watched Impractical Jokers, and no one from the show ever contacted me to tell me when/if the episode would air. I just assumed I was so awkward and boring that my clip would never make the cut. Fast forward a few months, when the incident was long erased from my mind, and my roommate gets a text from a friend along the lines of, “I think I saw your roommate on Impractical Jokers.” We frantically searched the Internet and found the incriminating clip (please save me the humiliation and don’t go searching for it). Over the next few months, people occasionally texted me to ask if it was really me they saw on Impractical Jokers (apparently the episode I was on is a common rerun... lovely). I would confirm and tell them how awkward the experience was and we would move on. (My mother is the only one who continues to text me when the episode airs. Thanks, mom). Light Bulb. He saw my episode of Impractical Jokers. I swear, I almost died laughing. As it turns out, a South African T.V. station plays reruns of Impractical Jokers and my episode has recently aired. Since then, countless people in my village have approached me about seeing me on T.V. You know how people assume that since we are American we know JayZ, or Beyonce? Well, now that they have seen me on T.V., they have all the evidence they need to assume I am a celebrity/T.V. star with connections to all their favorite celebs. I don’t think being “famous” is helping me blend in haha. Despite being eight thousand miles from home, I still find myself thinking, “it’s a small world” more often than I thought possible. I don’t have Internet, it’s too expensive to call my family in the States, and my community will never truly understand my life in America, but my random run-in in NYC with a guy slapping himself in the face has followed me across the Atlantic to rural Mmametlhake. Dang, it really is a small world. This is the most I will ever voluntarily show from that episode.